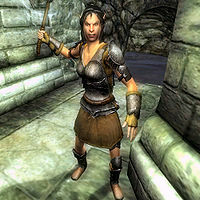 Laenafil is a Bosmer warrior currently guarding her leader, Roderick, who lies in a state of near-death in Fort Sutch, northeast of Anvil near Lord Drad's Estate. Little do Laenafil and her compatriots know that their efforts will prove futile. Laenafil does not appear in Fort Sutch until you begin the associated quest. Once you have begun, she spends all of her time wandering the interior of Fort Sutch, though she will never go for a swim in the water of the cave. This page was last modified on 27 March 2013, at 20:53.